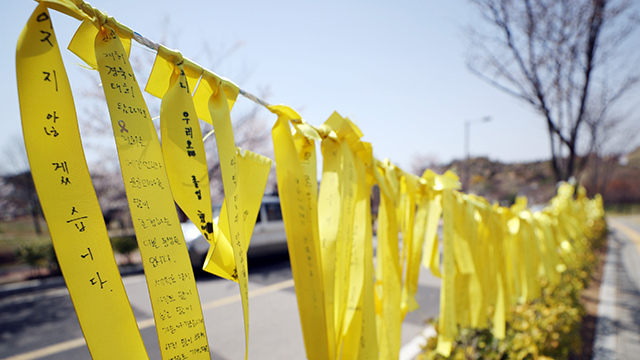 A ceremony was held to remember the victims of the tragic Sewol sinking who were not students and teachers at Danwon High School. The event was held at Incheon Family Park on Tuesday to mark the fifth anniversary of the ferry sinking. Some 300 people were in attendance, including Minister of the Interior and Safety Chin Young, Incheon Mayor Park Nam-chun and leaders of religious organizations. The ceremony began with a silent prayer and a memorial speech from a representative of bereaved families. This was followed by a memorial performance and ended with a floral tribute and incense burning. The remains of the passengers who were not students or teachers are enshrined in a space inside Incheon Family Park. Meanwhile, main opposition Liberty Korea Party Chairman Hwang Kyo-ahn was the only party chief to attend Tuesday’s event. The other party heads attended a memorial service organized by another group in Ansan, Gyeonggi Province.